What Else can I Expect from an Online Bachelor's in International Business Program? International business is a growing field, driven by the rise of multinational industries. As more companies ship goods to do business in other countries, manufacture goods overseas, and import raw materials, they need people who know how to conduct business internationally. A bachelor's in international business can prepare you for such a career and help you stay on the cutting edge of business theory and practice. The median income for people with an online bachelor's in international business in 2015 was $49,827 a year. This career has a potential to grow as technology continues to make working across borders easier. A bachelor of international business program typically covers subjects such as global financial systems, international management, and multinational marketing. Different programs will emphasise different aspects of international business and often offer multiple concentrations. This allows students to customize their studies and follow careers interests. Popular concentrations include marketing, finance, and culture studies. Some programs treat international business as a concentration and have more established business curriculums, while others offer it as a degree. Both options cover broad studies of business, giving you the tools to succeed and stay at the forefront of an evolving field. International business degrees take this concept one step further and give you the tools to apply that knowledge in diverse settings. With this in mind, it's important to figure out what you're looking for in a program. The bachelor of business administration in international business program at Florida International University is offered entirely online, with low tuition rates for in-state and out-of-state students. Online students are paired with advisers who can coach them through the program and help them succeed. Transfer students are welcome; high school transcripts and SAT/ACT scores are required if transferring less than 60 credits. Students can enroll in the spring, fall, and summer terms. Courses include advanced communication for business, financial management, international business, and MNC strategy. FIU is the largest university in Miami, with 50,000 students, nearly half of whom take some online classes. The school began offering online classes in 1998 and fully online programs in 2009. They offer a variety of student resources and financial aid options. Assignments are completed asynchronously. Applicants must have a minimum GPA of 2.50 in college courses. The bachelor of science in international business at Minnesota State University-Mankato is available partially online. Courses at the 300 and 400 level (generally junior and senior level classes) may be completed online, but lower level courses must be completed on campus. Students only need to earn 30 credits at MSUM in order to complete a degree there, allowing students to transfer credits from another online program. The program requires students to earn at least 120 credits and can be completed in four years. Out-of-state students pay more for tuition, but financial aid and scholarships are available to those who qualify. For admittance, students must have a minimum GPA of 2.70 and have completed 33 of the 44 required general education courses. MSUM was originally founded as the Mankato Normal School in 1868 and changed its name several more times before taking its current name in 1998. Minot State University offers three ways to earn your online bachelor’s in international business. The bachelor of science with a major in international business provides a full, focused program; the international business minor allows students to take courses alongside their major and have them recognized; and the international business concentration allows them to focus on international themes as part of a more traditional business degree. The bachelor’s requires students to earn 120 credits and can generally be completed in four years. Minot State accepts transfer credits from accredited universities. The program is offered completely online. Courses are offered asynchronously. 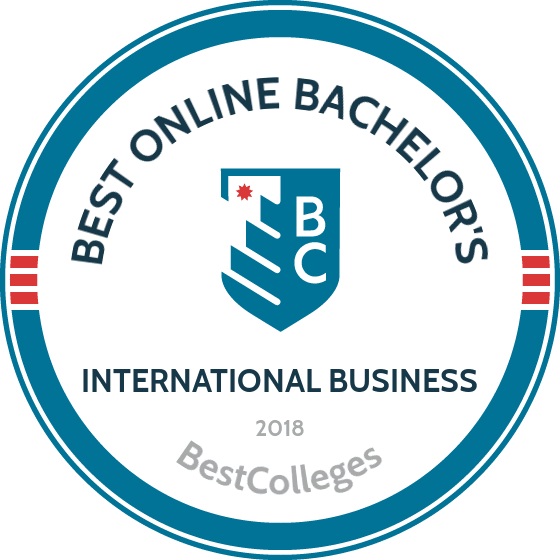 The bachelor's in international business includes courses in management information systems, international culture and management, corporation finance, and international business strategy. Minot State University is located in North Dakota. Financial aid is available for students who qualify, and the school offers payment plans. Golden State University-San Francisco offers an international business concentration as part of its bachelor of science in business program. Students are required to earn at least 120 credits, including 33 concentration credits and 33 general business education credits. Their virtual classroom model replicates seminar style courses, with small groups of students who hold asynchronous discussions. Courses include international banking and finance, doing business in East and Southeast Asia, international marketing, and import/export fundamentals. The school offers fully online and mixed classes. Grants, scholarships, and financial aid are available to students who qualify. Golden State University-San Francisco is a private, nonprofit school that was founded in 1901 and focuses on programs in management, accounting, business, taxation, and law. They have additional campuses in Los Angeles, Seattle, and Silicon Valley, and most of their students are working adults. The bachelor of science in business administration - international business program at Liberty University requires 120 credits and is delivered entirely online in an asynchronous format. Students can transfer up to half of their major credits from another university, and must take at least 30 credits through Liberty. Transfer evaluations by the school are free. Students enrolled full-time (12 or more credit hours per semester) pay a slightly lower tuition rate than part time students. Liberty is a nonprofit university based in Lynchburg, Virginia. The school offers a number of financial aid options, allowing students from a variety of backgrounds and financial situations to attend. Liberty, founded in 1971 as Lynchburg Baptist College, is the fifth largest university in the U.S., with students from all 50 states and 85 countries taking courses online. It is the largest Christian university in the world. Southern New Hampshire University, located in Manchester NH, offers an online bachelor of science in international business degree. The school offers their bachelor’s in international business as its own program; not as a concentration. Online courses are flexible and continuously available. Incoming students may transfer up to 90 credits from another institution. The entire program is 120 credits. The program takes, on average, four years to complete. Courses include multinational marketing, international strategic management, international economics, and principles of management. Student services include academic and career advisors and financial aid options. Financial aid is available for students who qualify, and active duty military and their spouses qualify for discounted tuition. SNHU, a nonprofit, private university, enrolls more than 80,000 online students. The school was originally founded as the New Hampshire School of Accounting and Secretarial Science. A public college based in Aberdeen, South Dakota, NSU is home to a major online program that offers a bachelor of arts in international business. This fully online degree examines the motives, values, and relations that characterize business throughout the world, giving students the skills to evaluate and organize business systems in a global setting. The online bachelor's in international business includes 85-87 credits of program courses, which focus on business, culture, politics, geography, and foreign languages. The 47-credit business core builds foundational skills through courses such as business communication, business ethics, and legal environment of business. An additional 12 credits of international business courses emphasize global perspectives on management, finance, and marketing, while six credits of electives allow students to explore topics such as international accounting, trade, or logistics. Online learners have the option to complete an internship for elective credit, gaining professional experience in areas such as accounting, banking, administration, or programming. The bachelor of science in international business offered by Linfield College is supported by a variety of student resources. Credits may be transferred from other schools toward the 125-credit program, and the school has advisers to help online students manage transferring credits, navigate their degree, and more. Linfield also offers credit for previous learning, allowing students to earn credit for skills and experience from their working life. Up to 31 credits may be earned through previous learning, making the program cheaper for adults with applicable experience. Courses include international business law, financial management, and international finance. Linfield College is based in McMinnville, Oregon, and was founded in 1858. Graduates are prepared for careers as import/export agents, international management consultants, and multinational managers. Tuition costs are the same for in-state and out-of-state students, and financial aid is available for students who qualify. Based in Columbia, Missouri, the Columbia School of Business is a member of the International Assembly for Collegiate Business Education, confirming the college's commitment to international business education. The school offers an online bachelor's in international business as either a BA or BS, introducing students to the global economy and cross-cultural exchange. The two degrees differ only in their general education requirements, offering the same business core curriculum and elective options. The 51-credit program core covers major topics including macro and microeconomics, principles of business management, and management science. Elective courses allow candidates to build specialized business skills, with the option to perform a professional internship in an international business environment. Students can complete up to six credits of internships, gaining hands-on experience and applying their course learning to the real world. All students in the program are also encouraged to take foreign language courses. The bachelor of business administration in international business program at the University of Houston-Downtown is one of the top business programs that's accredited by the Association to Advance Collegiate Schools of Business. This is a 120-credit program that can be completed mostly online. Only upper level coursework may be completed online, but students with at least 15 credits may transfer to UHD and apply those credits toward the program. Courses include global environmental issues in business, intercultural communications, economic development, and international marketing. Out-of-state students pay more for tuition, but financial aid is available for those who qualify. The University of Houston-Downtown opened in 1974 and offers a variety of bachelor’s and master’s degrees focused on career preparation. They maintain a 20-to-1 student-to-faculty ratio, meaning that students work closely with their professors and peers. Graduates are prepared for careers in international trade, marketing, and finance. Davenport University’s international business, bachelor of business administration is available online or on campus and requires 120 credits, which can be earned in four years. There are a number of required courses and elective choices, allowing students to tailor their experience. The program includes 42 credits in international business courses and 32 credits in business courses. Students can transfer credits from Michigan transfer agreement colleges. Courses are offered in asynchronous and synchronous formats. Classes include foreign language, principles of project management, international business law, and strategic finance. Students are required to complete an international business capstone. Davenport University is located in Grand Rapids, Michigan. It's a private, nonprofit school and has offered online courses since 2000. Nearly half of their students take their courses entirely online. A private college in Boca Raton, Florida, Lynn offers a bachelor of science in international business management that explores concepts of global expansion and global resource management, preparing graduates to serve in the world of international business. The program also emphasizes cross-cultural exchange, exposing students to multicultural perspectives and global viewpoints. The fully online degree curriculum builds skills in business, communication, and international relations, with courses such as global management, global marketing, and global operations strategy. Lynn stresses the value of practical experience, and all degree candidates can complete a three-week experiential learning activity known as a "J-Term." Occurring in January, these experiences vary based on student interests and program goals. Typical J-Term activities include internships, field research, and other professional learning activities. In the bachelor's in international business program, online learners also have the opportunity to travel to China and experience international business firsthand in a global business hub. Based in Sault Ste. Marie, Michigan, LSSU is the smallest public college in the state, serving around 3,000 students. The school's smaller size translates to a more personalized learning environment, and online business majors benefit from an average class size of just 7-20 students. LSSU's bachelor of science in business administration with a focus on international business emphasizes fundamental business knowledge along with specialized skills to meet the unique challenges of global business. The 33-credit major curriculum covers key topics in international economics, global marketplace competition, international business law, international management, and international marketing. Degree candidates also complete an international experience worth at least three credits, typically in the form of an internship or foreign study. Students often intern with international companies or those in the U.S. with a significant global presence, gaining a practical perspective on global business relations. LSSU also encourages all international business majors to perform a study abroad experience, which is easily facilitated through the school's 84 partner institutions around the world. A private liberal arts college on the northern shore of Lake Tahoe in Incline Village, Nevada, SNC offers a unique online bachelor of science in business administration with a major in global management. This innovative degree explores the increasing connectedness of the world economy, examining the impact of changing trade patterns, global competition, and cultural differences. This fully online bachelor of international business builds a foundation in management with a global focus, covering key topics such as finance, marketing, leadership, operations management, and cultural considerations. One of the program's most notable features is a service learning project that takes place in South Africa. This optional study abroad experience allows students to work alongside rural community and business leaders, gaining firsthand knowledge in regional studies, resource management, and global business. The program ends with a unique capstone project in which students examine a simulated developing economy, identify opportunities for positive economic change, and develop an effective solution for growth. Based in Waterville, Maine, Thomas is dedicated to business education, offering a unique bachelor of science in international business that examines the global implications of business practices. Along with business skills, students gain a broad understanding of global politics, geography, and culture, examining their intertwined relationship with global business. This versatile bachelor's degree in international business allows students to explore several professional paths, including international sales and marketing, information technology and software development, international banking and finance, logistics, and nonprofit management. The curriculum includes unique course topics such as comparative political systems, current world problems, and managing in a global market. Online learners can complete both internships and study abroad programs that offer the chance to experience global business practices in action. Thomas maintains connections with colleges, businesses, and other institutions in countries all over the world, including Argentina, China, the Czech Republic, New Zealand, and the United Arab Emirates. Many details will vary from one program to the next, such as required courses, the order in which they must be taken, and the teaching methodologies used. These differences can be important when choosing a program, as they can make some schools a better fit for you than others. Reading course descriptions can help you find the right program. The courses offered by a school will usually vary from others, though there are always some commonalities. We've listed a few sample courses below to give you an idea of what to expect. Foreign Language Courses: Given the nature of international business, many professionals will deal with partners or customers who speak a different language. Many programs will require you to take courses in a language of your choice or to prove fluency in it another way. International Business Law: Different nations have different laws, and ignorance of them is no excuse for breaking them. Courses like this may not teach you every country's law, but will give you the tools to learn and follow them. International Finance: This course covers the rules on loans and fundraising in different cultures. It will also help you navigate these situations in your future career. HOW LONG DOES IT TAKE TO GET AN ONLINE BACHELOR'S IN INTERNATIONAL BUSINESS? Generally, a bachelor's degree takes four years of full-time study to complete, but in some cases that time may be shortened. Many online programs provide students the freedom to schedule their own classes. Some programs offer cohort learning, which puts students together into small groups which support one another, providing a more traditional learning experience. These programs are usually taken synchronously. Cohort programs can take longer to complete than individual programs since you have to follow a specific course plan. Individual programs allow students to take courses in the order they choose, but have less options to work as a group, which is an important business skill to have. It is usually easier to work an individual program around a busy schedule, as they require less synchronous components. This learning format also gives students the option to take more, or less, credits each quarter. Accreditation is an important factor in choosing a school, regardless of your major. Accredited schools have met educational standards laid out by the Department of Education (DOE). Accreditation is important because it illustrates that the school upholds those standards and provide a quality education. It also shows employers that a student earned a modern education. Look for schools accredited by the Association to Advance Collegiate Schools of Business (AACSB), which works to improve the quality of business schools and programs. You can find a list of all the AACSB accredited schools here. Some schools might be accredited by other organizations as well, such as regional boards or the Council for Higher Education Accreditation (CHEA), which is a professional organization of universities that focuses on the importance of accreditation. These organizations are held to the standards set up by the DOE. Some states have additional requirements to which schools must adhere in order to be accredited, so some colleges focus on regional accreditation over national accreditation, which is common among vocational schools. You can find lists of all accredited schools on the DOE's website. According to the National Center for Education Statistics, business degrees make up the largest single field of degrees granted. As the world becomes increasingly globalized, international business degrees will become even more valuable. Companies will turn to people who can think globally and help them address issues that come up when companies expand internationally. Getting a bachelor's degree in international business can give you an edge over others competing for the same jobs. Many of the career paths available to students who earn an online bachelor's in international business are quite lucrative. Starting salaries tend to be above the national average, with plenty of room for growth. As with any career, experience leads to higher pay. A bachelor's in international business can lead to a variety of career paths. We've chosen five careers as examples of what is possible by earning this degree. Graduates are prepared for general business careers and more specialized positions. This role is focused on efficiency in operations, making sure that teams are well organized. They must tailor their tactics depending on the location of the teams. These managers ensure that sales run smoothly. They also negotiate new sales and contracts. Specialists are responsible for studying how globalization impacts their business and determining how to respond. They must become familiar with laws in the countries where they do business. This role ensures that companies are complying with laws in their home country and in the countries which their good are being exported. They also ensure that trade agreements and other documents are accurate. Professional organizations exist for most fields, which allow professionals to share ideas, network, govern themselves, and stay currents on trends and changing laws. Membership in such organizations can provide you with a significant boost to your career. There are many organizations related to international business. Below, we've highlighted a handful of them. The WTO is the leading organization in the field of international trade and business. They are an international body which works to ensure that trade is well managed and tracked. The ICC promotes global business, providing forums, professional development, and other services to help ensure that people can start and maintain successful, global businesses. FITA brings together distributors, agents, and others who work in international trade to help companies import and export goods and services legally and ethically. Paying for an online bachelor's in international business can be difficult, but there are a number of options out there to help. Anyone considering going to college should fill out the Free Application for Federal Student Aid (FAFSA) to see what is available to them. The FAFSA helps with federal and state loans, but there are also private loans available. Scholarships and grants can be offered by schools, professional organizations, and a variety of other sources.